1 bedroom suite available May 01, 2019. 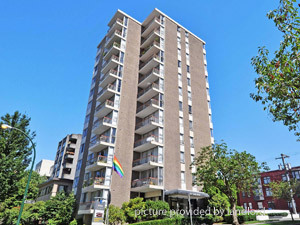 Suite Features: Dishwasher, Balcony, Public Transit Nearby, On Site Staff, Elevators, Fridge, Stove, Water, Heat, Coin Laundry, Parking, Underground Parking, Internet Ready. Building Amenities: On-Site Resident Managers, 24-Hour Laundry Facility, Free Wifi in Common Areas, Rentable Storage Lockers, Bike Storage, Smoke-Free, No Pets. About the West End Neighbourhood in Vancouver Named the best neighbourhood in Canada by the Canadian Institute of Planners. Vancouver’s West End is a beautiful microcosm of the reasons we all love to live here. Surrounded by beaches, Stanley Park and the seawall, and restaurants, cafes and cultural centres, you can’t beat the West End in terms of location. Lifestyle and convenience are key here – walk to work and every amenity. The West End neighbourhood welcomes you with a diverse yet tight-knit community. Call: 604-210-3645 to book a viewing with one of our professional on-site Resident Managers! Disclaimer: Photos posted may vary with suite actually available.